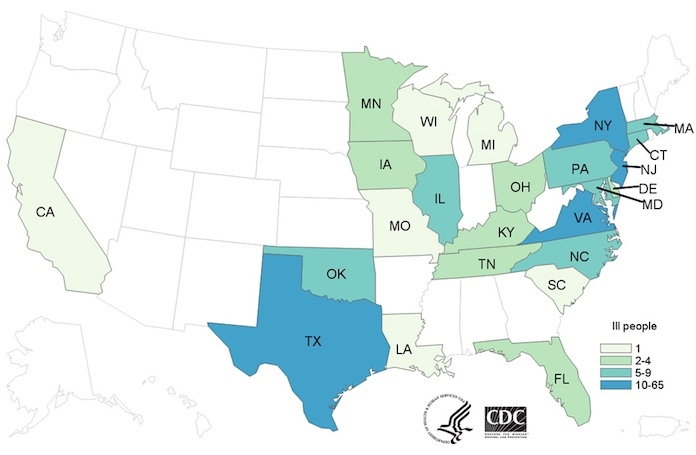 The deadly multistate outbreak of Salmonella infections linked to imported Maradol papayas has been updated by the CDC. There are four separate strains of Salmonella bacteria in this particular outbreak. There are now 210 people sickened in this outbreak. The bacteria in this outbreak include Salmonella Thompson, Salmonella Kiambu, Salmonella Agona, and Salmonella Gaminara. These strains of bacteria were found in ill persons and in samples collected from imported Maradol papayas. As of September 11, 2017, 210 people have been sickened in 24 states. Sixty-seven ill persons have been hospitalized. One death was reported from New York City. That is an increase of 10 more ill persons from 7 states since the last update on September 1, 2017. The case count by state is: California (1), Connecticut (6), Delaware (4), Florida (2), Iowa (2), Illinois (5), Kentucky (4), Louisiana (1), Maryland (9), Massachusetts (9), Michigan (1), Minnesota (4), Missouri (1), North Carolina (6), New Jersey (40), New York (65), Ohio (2), Oklahoma (9), Pennsylvania (8), South Carolina (1), Tennessee (2), Texas (10), Virginia (17), and Wisconsin (1). The number of patients infected by each bacterial strains are: Salmonella Thompson (135), Salmonella Kiambu (59), Salmonella Agona (10), and Salmonella Gaminara (6). California has now been added to this outbreak. Illnesses started on dates ranging from May 17, 2017 to August 27, 2017. Ill persons range in age from less than 1 year to 95. Among 205 ill persons, 124, or 60%, are female. Long 162 people, 109, or 67%, are of Hispanic ethnicity. Sixty-seven, or 40%, of interviewed patients have been hospitalized. One person in New York City has died. That is a very high hospitalization rate for a Salmonella outbreak. The typical rate is 22%. Officials have not explained why this rate is so high. Illnesses that occurred after August 11, 2017 may not be reported yet. It takes time between when a person gets sick, they see their doctor, tests are received and analyzed, and the illness is reported. Salmonella food poisoning is a reportable illness. And since the multiplier for Salmonella outbreaks is 38, because most people don’t visit a doctor when they contract this infection, there may be almost 8,000 people sickened across the country in this one outbreak. Three separate companies have recalled papayas that were grown at the Carica de Campeche farm in Mexico that is at the center of this outbreak. On July 26, 2017, Grande Produce recalled Caribeña brand Maradol papayas that were distributed between July 10 and July 19, 2017. The Caribeña brand has a red, green, and yellow sticker. On August 5, 2017, Agroson’s LLC recalled certain Cavi brand Maradol papayas grown and packed by Carica de Campeche. The Cavi brand has a purple, green and black sticker with the words “Cavi MEXICO 4395” in white. And on August 7, 2017, Freshtex Produce, LLC recalled Valery brand Maradol papayas grown and packed by Carica de Campeche. Valery Maradol papayas have a red, yellow, and green sticker with “Valery” in yellow letters. Officials are concerned that because there are four separate outbreaks linked to this type of fruit, other farms in Mexico may have exported papayas that are contaminated with Salmonella bacteria and have made people sick. The FDA is testing papayas imported from Mexico at the border and has placed Import Alerts on several brands. The symptoms of a Salmonella infection include vomiting, nausea, abdominal cramps, diarrhea, and a fever. If you ate imported Maradol papayas from Mexico and have experienced these symptoms, see your doctor.